This baby girl card is cute and pink. It has a pocket to hold many tags. Words could not express the joy of a mother who holds in her arms the little miracle she carried in her womb for nine whole months. For us who are family and friends, we look on with awe at the bundle and exclaim, "Oh, so cute!" She's a girl! She's a bundle of joy! She's a little miracle! And ... ohhh, she's so cute! With this in mind, I decided to design a card that says all these. I chose a white card stock and a pink strip designer paper for the main card surface. Then add cute little rubber stamp images like a pram, pacifier, tiny hearts, lacy heart, and yes, a baby stroller. 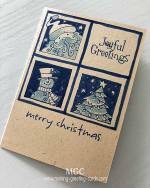 Stamped wordings like 'Little Miracle', 'Oh, so cute!' 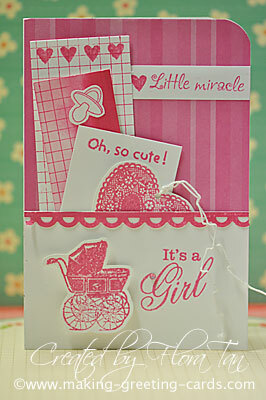 and 'It's a Girl' are added to tags and front of this baby girl card too. All in all, it's a girly baby greeting card. Pink strip designer paper is from the spring stack - 12 x12 acid free printed paper by DCWV. It has 180 sheets in the stack. So I'm spoiled for choice. white colour card-stock 8.50" x 6.25"
white colour card-stock 4.25" x 2.50"
white colour card-stock 1.75" x 4.75"
white colour card-stock 1.50" x 4.50"
white colour card-stock 2.00" x 2.50"
white colour card-stock 5.00" x 5.00"
pink strip designer paper 4.25" x 6.25"
word stamps: Oh, so cute!, Little Miracle, It's a Girl. Use pink ink pad and colour one strip on one side of the 5" x 5" white card. 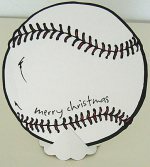 Make sure the card is dry before punching out the border and attach to the longer side of the 4.25" x 2.50" white card. 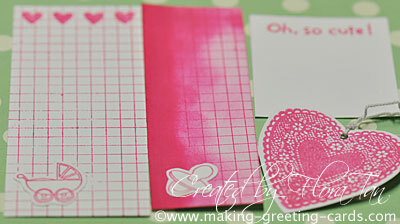 Use glue or double-sided tape to cover front of card with the pink strip paper. 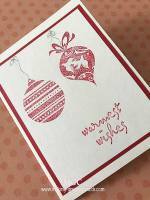 Apply glue or double-sided tape and attach white colour card-stock 4.25" x 2.50" with border on the top to bottom of card front to make a pocket. 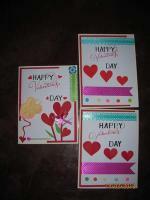 Stamp baby stroller, little pram, lacy heart, little miracle and pacifier on the remainder 5" x 5" card stock with pink ink. Trim around the stamped images. For Little miracle, cut a strip and glue to the front of card about 0.75" from the top and flush to the right edge of pink strip paper. Stamp 'It's a Girl' on bottom right of card with pink ink. Glue a sparkling pink gem to the flourish of G in Girl. Tags : 1.75" x 4.75"
Glue baby pram at bottom left. Stamp 'Oh, so cute!' with pink ink on 2.00" x 2.50" white card. Punch a tiny hole on the top of the heart and tie thin ribbon or string. Finally, use a corner rounder on the top right of the folded card and insert all the tags into the pocket of the baby girl card.